Following a surge in the number of dengue cases in Delhi, the government has launched a 24-hour helpline -- 011-23307145 -- that will function round the clock to provide all relevant information about dengue and its treatment. The Health minister has directed municipal commissioners to send out bulk SMSes to people containing the message: "Dengue is curable and there is no cause for panic." With 613 fresh cases reported over the last one week, the Delhi government was forced to cancel leave of doctors, open 'Fever Clinics' to treat those hit. Dengue infection is caused by a virus. It occurs commonly as dengue fever. Occasionally the patient suffering from dengue may develop bleeding. Common sites for bleeding are nose, gums or skin. Sometimes, the patient may have coffee ground vomiting or black stools. This indicates bleeding in gastro intestinal tracts and it is serious. The patient with dengue who has bleeding has dengue haemorrhagic fever (DHF). Rarely the patient suffering from dengue may develop shock, then it is called dengue shock syndrome (DSS). When should I suspect dengue? Dengue should be suspected when you have sudden onset of fever. The fever is high 103-105 degrees F or 39-40 degrees C. It is accompanied with severe headache (mostly in the forehead), pain behind the eyes, body aches and pains, rash on the skin and nausea or vomiting. The fever lasts for 5-7 days. In some patients, fever comes down on 3rd or 4th day but comes back. All the above symptoms and signs may not be present in the patient. The patient feels much discomfort after the illness. There are several types of fever, when should dengue be suspected? The characteristics of dengue that make it different from other causes of fever are the pain behind the eyes, severe pains in the muscles, severe joint pains, and skin rashes. These features make the diagnosis of suspected Dengue likely. The severe joint pains caused by DF are the reason why DF is also called break-bone fever. What is the difference between suspected and probable case of dengue? If a patient suspected to be having dengue has reduced platelets or an increase in blood haematocrit, then the patient has probable dengue. 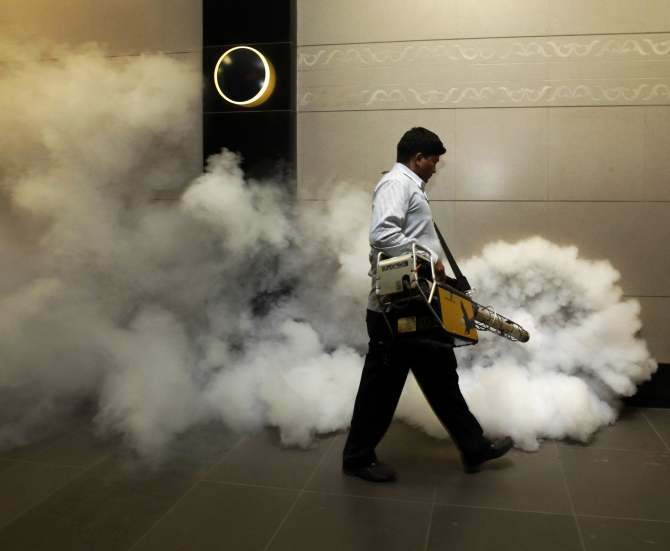 These additional findings make dengue more likely. Patients with dengue may not have a high haematocrit if the person was anaemic to start with. (Platelets are cells in blood that help to stop bleeding. Haematocrit indicates the thickness of blood). Can you get dengue again after suffering from it once? 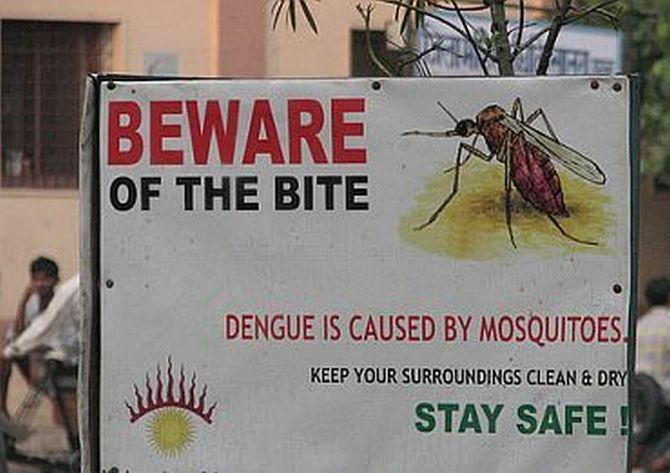 It is possible to get dengue more than once. Dengue can occur because of 4 different but related strains of dengue virus. If a person has suffered from one virus, there can be a repeat occurrence of dengue if a different strain is involved subsequently. Being affected by one strain offers no protection against the others. A person could suffer from dengue more than once in her/his lifetime. Can the diagnosis of dengue be confirmed? There are laboratory tests that provide direct or indirect evidence for dengue fever. These tests provide evidence for the occurrence of dengue infection. There are some additional tests that can help to identify the type of dengue infection. The tests for confirmation of dengue should be done in reliable laboratories. How can someone get dengue fever? Dengue fever occurs following the bite of an infected mosquito Aedes aegypti. This type of mosquito has a peculiar white spotted body and legs and is easy to recognise even by laymen. It breeds in clean water and has a flight range of only 100-200 metres. The mosquito gets the dengue virus after biting a human being infected with dengue virus. Can someone get dengue fever from another person? Dengue does not spread directly from person to person. It is only spread through the bite of an infected mosquito. When does dengue develop after getting the infection? After the entry of the virus in the person, it multiplies in the lymph glands in the body. The symptoms develop when the virus has multiplied in sufficient numbers to cause the symptoms. This happens generally about 4-6 days (average) after getting infected with the virus. Can people suffer from dengue and not appear ill? Yes. There are many people who are infected with the virus and do not suffer from any signs or symptoms of the disease. For every patient with symptoms and signs there may be 4-5 persons with no symptoms or with very mild symptoms. Can dengue fever be treated at home? Most patients with dengue fever can be treated at home. They should take rest, drink plenty of fluids that are available at home and eat nutritious diet. Whenever available, Oral Rehydration Salt/ORS (commonly used in treating diarrhoea) is preferable. Sufficient fluid intake is very important and becomes more important in case DF progresses into DHF or DSS where loss of body fluid / blood is the most salient feature. It is important to look for danger signs and contact the doctor as soon as any one or more of these are found. What is the treatment? Is it curable? Like most viral diseases there is no specific cure for dengue fever. Antibiotics do not help. Paracetamol (can be purchased without prescription) is the drug of choice to bring down fever and joint pain. Other medicines such as Aspirin and Brufenshould be avoided since they can increase the risk of bleeding. Doctors should be very careful when prescribing medicines. Any medicines that decrease platelets should be avoided. Can dengue fever become dangerous? The infection can become dangerous since it may cause damage to the blood vessels. The damage may range from increased permeability of the blood vessels, causing leakage of blood fluid/plasma into various organs to completely broken blood vessels that causes bleeding. The symptoms and signs of dengue haemorrhagic fever and dengue shock syndrome are related to damage to the blood vessels and derangement in functioning in components of blood that help it to clot. Can people die from dengue fever? People who suffer from dengue fever have no risk of death but some of them develop Dengue Haemorrhagic Fever or Dengue Shock Syndrome. In some of these cases death can occur. With proper treatment, the patients with Dengue haemorrhagic fever and dengue shock syndrome can recover fully. Good treatment provided in time can save most lives. When should a patient suffering from dengue go to the hospital or consult a doctor? Generally the progress towards dengue haemorrhagic fever or dengue shock syndrome occurs after 3-5 days of fever. At this time, fever has often come down. This may mislead many of us to believe that the patient is heading towards recovery. In fact, this is the most dangerous period that requires high vigilance from care-givers. The signs and symptoms that should be looked for are severe pain in the abdomen, persistent vomiting, bleeding from any site like, bleeding in the skin appearing as small red or purplish spots, nose bleed, bleeding from gums, passage of black stools like coal tar. Bring the patient to the hospital whenever the first two signs, namely, severe pain in the abdomen and persistent vomiting are detected. Usually it is too late if we wait until bleeding has occurred. The most dangerous type of dengue is the dengue shock syndrome. It is recognised by signs like excessive thirst, pale and cold skin (due to very low blood pressure), restlessness and a feeling of weakness. Is there a vaccine to prevent dengue fever? 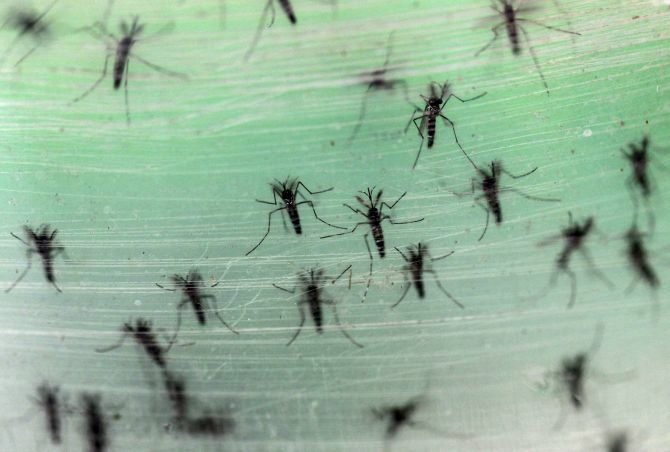 A vaccine has been developed to prevent dengue fever, but it is still under trial. It is not yet available in the market. Scientific progress is likely to help in prevention of dengue fever by vaccination in the years to come. Are there any long-term ill effects of dengue fever? Most people who suffer from dengue fever recover in 1-2 weeks time. Some may feel tired for several weeks. However, if symptoms persist after this period, consult a doctor. Where does the mosquito that spreads dengue live? The highly domestic mosquito Aedes aegypti rests indoors, in closets and other dark places. Outside, it rests where it is cool and shaded. The female mosquito lays her eggs in water containers in and around the homes, and other dwellings. These eggs will develop, become larvae, and further develop into adults in about 10 days. How can the multiplication of mosquitoes be reduced? Dengue mosquitoes breed in stored, exposed water collections. Favoured places for breeding are barrels, drums, jars, pots, buckets, flower vases, plant saucers, tanks, discarded bottles, tins, tyres, water coolers etc. To prevent the mosquitoes from multiplying, drain out the water from desert coolers/window air coolers (when not in use), tanks, barrels, drums, buckets etc. Remove all objects containing water (e.g. plant saucers etc.) from the house. Collect and destroy discarded containers in which water collects e.g. bottles, plastic bags, tins, used tyres etc. How can I prevent mosquito bites to prevent dengue? There is no way to tell if a mosquito is carrying the dengue virus. Therefore, people must protect themselves from all mosquito bites. Dengue mosquitoes bite during the daytime. Highest biting intensity is about 2 hours after sunrise and before sunset. Wear full sleeves clothes and long dresses to cover as much of your body as possible. Use repellents -- be careful in using them in young children and old people. Use mosquito coils and electric vapour mats during the daytime also to prevent dengue. Use mosquito nets to protect children, old people and others who may rest during the day. The effectiveness of these nets can be improved by treating them with permethrin (pyrethroid insecticide). This bed-net is called Insecticide Treated Nets and are widely used in the prevention of malaria. Is there any advice for the patient with dengue fever to prevent the spread of the disease to others? The spread of dengue from a patient to others is possible. The patient should be protected from contact with the mosquito. This can be achieved by ensuring that the patient sleeps under a bed-net. Effective mosquito repellents are used where the patient is being provided care. This will prevent the mosquito from biting the patient and from getting infected and spreading it to others. Any advice on travel if there is an outbreak of dengue? There is no travel restriction. However, you should be aware of what to do if you are travelling an area where dengue has been reported. This includes observing prevention measures described in these frequently asked questions and answers and reporting to the doctor if you have fever and are worried that it might be dengue fever. What should the doctors treating dengue do? Patients suspected to be suffering from dengue haemorrhagic fever or dengue shock syndrome should be admitted to a hospital without delay. The progress of these patients should be monitored regularly at 1-2 hours interval. Platelet counts and haematocrits should be monitored repeatedly to review the progress of patients. If the haematocrit levels fall dangerously then a blood transfusion should be considered. A fall of more than 20 per cent as compared to previous levels may be an indication for transfusion. If the haematocrit values rise the patient should be given fluids intravenously and the fluids carefully monitored to ensure that the patient does not get excess fluids. A rise of more than 20 per cent as compared to previous levels may be an indication for IV fluids. The doctor should decide based on best judgement of patient's condition. What should the doctors treating dengue NOT do? Do not prescribe aspirin and brufen or any other medicine that reduces the platelets or increases the tendency to bleed. Avoid giving IV fluids unless the patient is bleeding or the haematocrit level is rising progressively. Avoid rushing into giving blood transfusion unless the haematocrit is falling dangerously. Do not give platelet transfusion unless the platelet count is very low or unless there is bleeding. In the case of a dengue outbreak or epidemic what are our strategies? Prevention of mosquito breeding places remains our mainstay. However, to stop or to slow down the transmission it may be supplemented by "thermal fogging", using fogging machines. In fogging, we use an insecticide that has an immediate knockdown effect on adult mosquitoes. When fogging is undertaken after an epidemic occurs, it is unfortunately too late. Fogging, to be effective, should be done at about 3-4 days interval. It is expensive and time consuming. Therefore, measures undertaken by the community, for the community, to prevent the breeding of mosquitoes is far more cost-effective than containment measures once an outbreak occurs. "Walk Your Way To Life"
Walking is the best form of exercise. It is low-impact on the joints and high-impact in results. It burns calories on per-mile basis equivalent to running (average 100 per mile for an adult, only the distances vary). Labeled as leisurely exercise though, it offers a great workout for the entire body. But how to make it better? Increase pace, not the stride. Walk at a brisk speed of 12-13 min per mile (4.5 mph) from an ordinary walk of 3 mph. Secret: Take more steps per minute at a normal stride. Do not increase stride. Longer stride in less time causes fatigue and is less effective. Line Yourself: Olympic and other elite race-walkers swing their hips more often than the sedentary folks do. Their feet move in line, as opposed to walking with legs at shoulder width. Proper arms movement: Swinging arms correctly are necessary. Arms should be bent at the elbow at an 85 degree angle, and should be pumped close to the body from the lower breast bone to the back of the hips. This actually propels the body forward, and helps achieve a quicker and shorter stride. Try to get up early in the morning rather before dawn. After awaking, take 2-3 glasses of water. Never take bed-tea, as it is harmful to your digestion system. Neither eat too much nor too little, your meal should be balanced. Do not have meal while you are watching the TV or you are reading something. Always take fresh, hot & digestive food. There must be a gap of about 4 hours between lunch & dinner. Do not have the fruit with the food; it should be taken one hour before or after the meal. The water should also be had in the same manner. Take some rest after lunch & walk a little after dinner.